MACBETH as presented by Cream-Faced Loons, is an easy to understand re-telling of William Shakespeare’s classic Scottish tragedy, made funny yet faithful. Have you always wanted to ‘do’ a bit of Shakespeare but feared you’d just make a fool of yourself? Be it through lack of understanding or simply because it’s a bit posh? Well, think again! Known as Shakespeare’s bloodiest of plays, Abey Bradbury (Producer, Director and Head Loon), picks the bones out of the story, from under Shakespeare's nose, and confidently immerses us in a world of simplicity and heightened storytelling. Recreating a banquet held by King Malcolm, the audience is invited into the non-theatre space, at the International Anthony Burgess Foundation, to celebrate the 10 year defeat of the tyrannical Macbeth. The venue is essentially a high-ceiling, bare-brick building that lends extremely well to becoming a banqueting hall; complete with head table, benches for the audience, drinks on arrival and a very warm welcome. To the strains of live music, you are shown to a bench and immediately offered a glass of wine or water. What show does that? With beverages flowing, the play commences as we pretend to be an invited guest - raising our glasses to a whole host of toasts. If you fear this kind of setting, do not on this occasion, the ‘immersive’ element is carefully and cleverly underplayed leaving any potential ‘awkwardness’ at the banqueting door. Before you know it, you feel as if you know the other guests and in particular, you are soon given hints and clues to the ‘Players’ performing around you. Hints offered by way of serving wenches who encourage the audience with sniggers, back-handed comments and hilarious mickey-taking. Many famous speeches are interspersed with clearly devised modern text that weaves like an elegant tapestry. If anything, the modern imaginings of scenes, often considered long and drawn-out when being faithful to Shakespeare’s text, are really illuminating and ensure the pace bobs along nicely. What I particularly like about the cast is how happy and relaxed they are throughout the performance. Their abundant joy at ensuring this tale is told in a fresh and exciting way is infectious, like catching a smile across a crowded room. Tom Hardman as Will/Banquo, offers a credible Scottish accent as he ranged from boyish charm to laddish bravery to hilarious clown. Hannah Potts as Nana, plays her character so warmly that you forget she is acting and want to be her next BFF. Beware! Matt Gordon, who’s Player is a triumph in timing, energy and carefully considered teamwork and is the glue to this performance. Amanda Vokes as Fleance Banquo, has the difficult task of being permanently miffed; delivering ‘death stares’ efficiently. When given a chance to ‘lighten-up’, Amanda carefully delivers without belittling her character’s core values. Andi Morgan as Martha, is highly watchable and very witty in her portrayals. Her movements and fight skills are a joy to behold. Alexander McCoy as Robert, deliberately underplays his character and sheepishly joins the game of recreating the tale for the gathered guests. It works extremely well. John Hatziemmanuel as King Malcolm, veers between Ewan McGregor as King Malcolm and Sean Connery when playing other characters; added to the amusement. CreamFacedLoons.co.uk deserve a faithful and loyal audience as their work is well worth following. Aimed at age 14+, I would trust this company to educate my children any day. 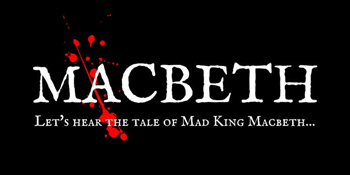 Macbeth is on until 9th Feb.